David Levy presented 25 volumes of observation logs to the Linda Hall Library in Kansas City last month. A prolific comet hunter has donated almost 60 years' worth — and counting! — of historic observation logs to be pored over by the public. Only one of David Levy's 18,500 recorded skywatching sessions contains the time he first spotted what would be named Comet Shoemaker-Levy 9, which later played a part in the first solar system collision humanity ever witnessed as it tore apart and barreled into Jupiter. But embedded in the others are a plethora of significant night-sky discoveries and the enduring records of the changing skywatching world from the 1950s to today. "I see the night sky as a personal friend, and it's always been there for me," Levy told Space.com. "I'm out there all the time, looking up at the night sky. It's really something that I'm close to, and a deeply ingrained part of my life." This new donation, the record of that "friendship," will be conserved for future skywatchers and science historians to see. David Levy ceremonially presented 25 of his observation logs to Linda Hall Library's president, Lisa Browar, on Sept. 10, 2015. Levy offered to donate his logs after a visit to the Linda Hall Library 11 years ago, when he pulled the famed astronomer John Herschel's observation logs from the collection to read. Last year, when he visited again, he arranged a lecture and public presentation to officially hand off the logs he'd put together so far. "He said, 'I feel like I'm giving you my children,'" Lisa Browar, president of the Linda Hall Library, told Space.com. "And I told him, if it made him feel better, he could think of it as a joint custody." The handoff received a standing ovation by the 300-person audience, she added. Since Levy first started scanning the sky for oddities, he's discovered 23 comets and "a couple hundred" asteroids, and observed 88 eclipses, he said. The asteroid 2673 Levy was named after him in 1988. "I've seen many comets; I've seen a lot of exploding stars and one very bright one," Levy said. "And being at NASA when the comet we discovered collided with Jupiter was a big, big thing — a tremendous thrill. It was the first time in the history of humanity that two significant objects in the solar system, like a comet and a planet, collided together." The scars of Shoemaker-Levy 9's pieces hitting Jupiter were visible by telescope for months. Levy's records of skywatching events are short and cryptic, mostly in code that can be deciphered by referring to the front of each volume. Over time, though, he has become more verbose — because he knows the logs will be read and because of a renewed focus on literature in his work, he said. Levy recently completed a Ph.D. on the night sky in the time of Shakespeare. Browar agrees. "Any kind of document, whether it is a letter or the draft of a book or a poem or observation logs, anything that is considered a first person account … is the truest expression of someone's experience," Browar said. "These logs are a true expression of what David saw and viewed as he was looking at the night sky through a variety of telescopes. It's completely unfiltered." 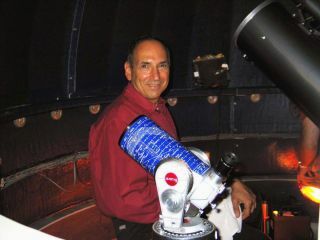 Astronomy has changed "enormously" since he first started observing the night sky, Levy said. In fact, now "it is almost impossible for an amateur astronomer to discover a comet, and it's partially my fault," Levy said. After the discovery of Shoemaker-Levy 9, he said, Congress talked with co-discoverer Eugene Shoemaker about setting up automated comet search processes — something that they both supported. "But I'm still looking," Levy said. "You never know … And it's the search that's the most important thing; it's definitely not the discovery. If all I wanted to do was find a comet, I would have given up years ago." Editor's Note: This story was updated on Oct. 14 to correct a typo in Levy's quote in the final paragraph: he said "comet" rather than "planet."